We had an educational few days. Luna was in heat! She yowled and howled and sat by the door giving us plaintive looks. When we got Luna, Father and I were in agreement we would let her have one litter and then get her spayed. When she went into heat, Father almost changed his mind because he wasn't sure he was ready for "his baby" to grow up. 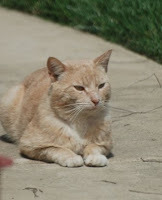 The first day we let her out, her fluffy orange friend who hangs out regularly showed up and stayed all day. We kept an eye on the two and came to conclusion fluffy was a girl because nothing was happening. 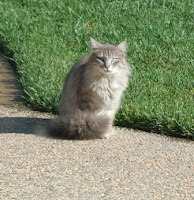 However, whenever Luna came in to eat or came over to talk to us on the patio, fluffy cried from the bushes, wanting her to come back. He and Luna courted and danced for the afternoon while Fluffy chaperoned. The three of us were so enthralled watching the courtship and Father taking pictures and the two of us explaining the facts of cat life to James that even though I made dinner and sat down to eat, we all forgot to eat. When Luna finally came in for the evening, her mate (as James calls him) hung around and watched Luna as she ate and jumped up on one of the kitchen chairs to sleep. We took pity on him and put out a plate of food which was gobbled down in seconds. He was still around in the morning when we let Luna out, but Fluffy (who had gone home at some point) - had returned with her sibling. Absolutely beautiful blue eyed cat and undoubtedly male. I just watched him spray one of our bushes. Anyway, he and fluffy chaperoned and Mate was intimidated for a while, but got over it. Luna is no longer in heat and Mate has returned home. Blue eyes and another friend however have decided to hang out for a while and Luna doesn't seem to mind. However, we are keeping a watchful eye out to make sure they aren't trying to take over her territory. So our baby may be having babies in the not so distant future. Keep your fingers crossed.